Lisa Brown is an avid lover of historical fiction and genealogy. She is intrigued by the natural order of life, of the sometimes serendipitous and sometimes cataclysmic results of life's random and unexpected events and how they can echo down through the generations. Digging into the past led to the discovery of a wealth of fascinating people, places, and events, and a desire to tell some of their stories. It is the ones having to do with her native Canada that she is most passionate about. A Casualty of Grace is an historical fiction novel written by Lisa Brown. It was 1895, and Oliver and Simon were on an ocean voyage to a strange land and an even stranger future. Everything in their lives had changed when first their father died and then their mother followed in 1893. Oliver was 10 years old then, and felt a keen sense of responsibility for his younger brother. He had spirited both of them out of the house before anyone knew of his mother’s passing, and the two boys started walking to the farm where their aunt worked. When they got there, they found that the farmhouse had burned down, and their aunt was nowhere to be found. A kindly family took them in for a few days, but it was a temporary reprieve, and the workhouse, something Oliver had dreaded, became their home until they were made part of the British Home Children program and sent off to Canada. Despite the promises made to Oliver that the two would not be separated, Simon was placed in a wealthy home to be the lone son in a family with four daughters. It was a great opportunity for his little brother, but Oliver couldn’t help feeling that he had failed Simon. Oliver was sent to live with the Pritchards, who lived on Mrs. Pritchard’s family’s farm. While she was a warm and compassionate woman who was caring and considerate of their young charge, Mr. Pritchard was a harsh man who quickly took a dislike to Oliver and seemed determined to make his life hell. Lisa Brown’s historical fiction novel, A Casualty of Grace, is an outstanding and beautifully written novel about two British brothers who were sent to Canada in a migration experiment that exposed many of the young participants to suffering and hardship. It’s also Oliver’s coming of age story, as the twelve-year-old navigates his way through the dysfunctional family he’s become an unwilling part of. Watching Oliver and Mrs. Pritchard bridge the divide of fear and hostility engendered by her alcoholic and abusive husband is inspiring and makes what might have been simply too grim a story work marvelously. Liza Pritchard is as unforgettable a character as Oliver is, and their interactions are poignant and moving. Brown also brings to life the stark majesty of the Canadian seasons, especially winter, in her novel, and many of the nature descriptions and passages are lyrical and unforgettable. A Casualty of Grace is most highly recommended. 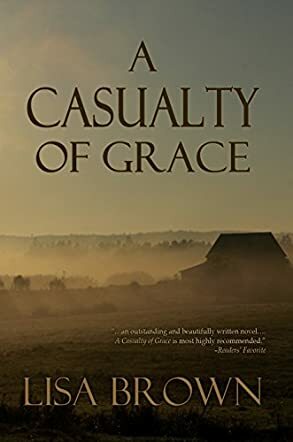 A Casualty of Grace by Lisa Brown is the story of what happens to twelve-year-old Oliver and his younger brother when, orphaned, they are taken from the workhouse across the ocean to live on a Canadian farm. Oliver has to work and becomes the subject of cruel abuse at the hands of Mr Pritchard – while Simon is allowed to attend school. Climate, life and of course accents and ways of speaking are very different and the boys have to adjust. Mystery surrounds the reasons for Mr Pritchard’s alcohol dependency, his temper and his mistreatment of his wife and Oliver. Oliver is sensible and hardworking and knows he needs to keep on the right side of Mr Pritchard. Concerned to keep his younger brother safe, he resigns himself to years of toil and sadness. Then, just as he learns the truth from Pritchard’s kind wife, Liza, about the causes of her husband’s alcohol dependency and abusive behavior, events take an unexpected twist and life changes forever. Lisa Brown is an excellent writer and storyteller, and draws the reader into the world of her characters with a suspense filled plot that always moves at a good pace. A Casualty of Grace is a work of fiction but is in many ways representative of what really happened to many innocent children in the late 1800s who were taken from the UK to supposedly better lives in Canada. The plight of the characters is vividly and sensitively portrayed and will leave the reader saddened, horrified, but at the same time rooting for a better outcome. Oliver himself is a strong and believable main character. Liza Pritchard’s sense of being trapped in an abusive marriage and her reasons for not leaving are powerfully portrayed with great insight. I also liked the way the cause and reasons for Mr Pritchard’s abhorrent behavior are uncovered and understood by young Oliver - and the way Oliver himself develops the strength of character to know he is not deserving of this mistreatment. This poignant story is beautifully written and is a real page turner. A story that hints at truth and history through the plight of two young boys and has a powerful message about faith, forgiveness, hope and courage. Sincerely recommended. A Casualty of Grace by Lisa Brown is Oliver's story, about a young boy, only thirteen, who loses his parents and is left responsible for his younger brother, Simon. In late nineteenth-century England, that could mean only one thing for two orphaned boys with no other family to help - the workhouse. And, as luck would have it, being chosen to leave England behind for the chance of a better life as an adopted child in Canada. This may be Oliver's story, but it is also the story of many other British Home Children who were shipped across the ocean to a land that was sometimes not so welcoming and to families that were often cruel and abusive. Oliver is promised that he and his brother will be kept together. Initially the promise is broken. Simon is sent to a wealthy family in Hamilton while Oliver is sent off to a farm outside of Waterdown. Oliver's situation is dire right from the beginning and the abuse is almost more than he can bear. So like many other British Home Children, Oliver must endure the primitive living conditions, the hard work and the abuse, even though Mrs. Pritchard, his adoptive mother, reassures him that things will not always be the way they are. Is there a silver lining to his situation? The stories about the many British Home Children relocated to families across Canada and the United States are not often told. While there were a few happy endings, most placements ended up in abuse, hard work and neglect. Lisa Brown has worked an exciting plot about one boy's struggle to come to terms with his sad lot in life, in his search for a silver lining, an end to his abuse. With exceptional character development, historically relevant information (not overly done), and well described scenes, this plot moves along to an exciting and very unexpected climax. This is a stellar story with a real historical reference. Well done! A must-read!